Dinah and Skint are close friends and they know a lot about each other. But lately it seems as if their friendship is slowly falling apart by all the things left unsaid. Skint can't tell Dinah about the anger that he is trying to contain over his father's illness, and Dinah just wants to help Skint, even if her methods don't always seem that effective. In Dinah and Skint's lives, it's hard to know when helping is hurting, and the consequences are devastating. N. Griffin's novel is quirky and quick-witted, full of humor and heartbreak. Dinah is an energetic and passionate character, brimming with ideas and eagerness to help those in her community, and loyal to Skint and the Girls Friendly, an apathetic church group with dwindling members. Skint is just as passionate, but he is more reserved, choosing to keep quiet about his own troubles and to focus on helping others, no matter the means and consequences. Through Dinah and Skint's haphazard attempts to do right in their community, Griffin asks big questions such as, why do we ignore the problems in our own communities? Why do we allow ourselves to be so easily distracted from all of the need in our lives and our world? With sliding perspectives and a constant push and pull between Dinah and Skint, Griffin keeps readers wondering what will happen to these lovable and flawed characters in the end. The writing is unique and magnetic, and the conclusion haunting. Cover Comments: This is one of the prettiest book packages I've seen in a long time. I love the partial dust jacket of the hardcover and the image on the cover. It fits the story so well! Haunting is right! 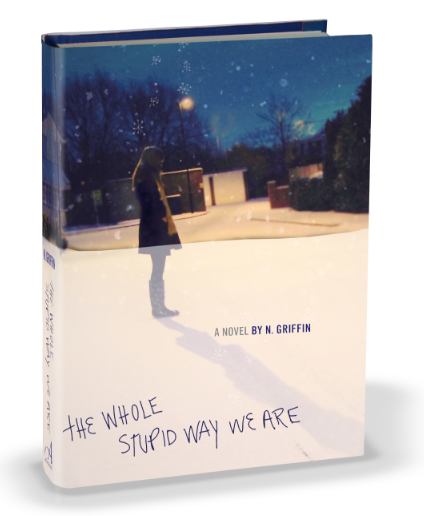 N. Griffin is brilliant and much more daring as a writer than I am! AH, she is good! That ending, gah! Book Trailer for Entangled by Amy Rose Capetta!